The Kahr CM9 is a compact and lightweight handgun. It weighs in at 19.25 ounces, loaded with six rounds. These little details make this pistol a great option for your everyday concealed carry weapon. With the ease of carry this firearm has, you are probably shopping around for the best Kahr CM9 holster. There are plenty of options for you and I went searching for the best ones. After looking through the different holsters available for this firearm, I decided the Badger Concealment Kahr Arms IWB holster is my top choice. I chose this one because it is comfortable, even while sitting. It can be put on and removed easily. Drawing is smooth and re-holstering the firearm is easy. It seems to be made well and has adjustable retention. Let’s take a look at some other holsters that made the top picks. First, I would like to talk a little about what you should think about when choosing your holster. Since this is such a lightweight handgun and very good for concealed carry, I will focus mostly on that aspect. A concealed carry pistol needs to be invisible to strangers, secure, yet easily accessible, for you, at any time. Choosing the right holster adds to your overall self defense abilities. Price should not be the only factor in your decision. Here are some things to consider when shopping for the right holster. Leather or molded plastic are the two best choices for holster materials. Leather needs time to break in and stretch. Just like that comfortable pair of leather shoes, leather holsters will mold to your body over time. 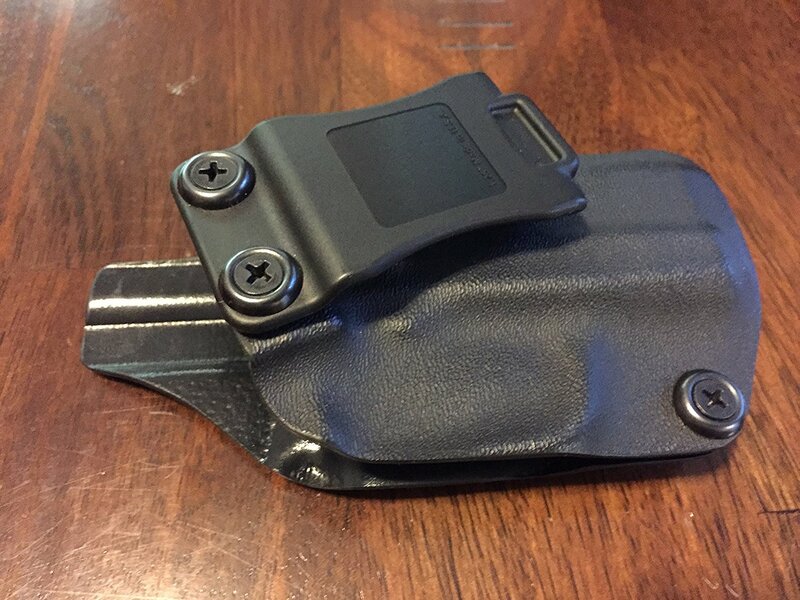 Thermoplastic holsters, like Kydex, are molded and will not stretch or break in over time. You want your holster to be molded to your exact gun and maintain it’s shape for the long haul. This will affect whether you have quick access or not and can affect retention. The mouth of the holster should stay open when the gun is not in the holster. This allows for easier one hand reholstering. All quality concealed carry holsters should allow for one handed drawing and reholstering. Retention keeps the gun in the holster. There are different types of holsters, with different retention. Leather, especially after the break in period, naturally holds your handgun by friction. It is best to have the rough side of the leather on the inside of the holster. Kydex or polymer holsters don’t naturally grab your handgun without tension screws. You tighten or loosen these screws to get the right amount of retention needed to secure the firearm in place. Level two retention holsters have the natural friction or tension screws, as in level one, but also have some kind of extra component. This could include a hood, back strap or a finger or thumb operated lever. There are level 3 and 4 retention holsters but they become very big and bulky and most consider those not for concealed carry. Inside waistband holsters offer the most concealment someone can wear. Not much more than the gun’s grip shows above the waistline. They are a very popular holster choice. They sit inside your waistband, between your pants and underwear. Most find that they need to buy pants about one or two inches bigger, in the waist, in order to conceal this way. Many outside the waistband holsters have the “FBI cant” which means the gun is tilted forward. Tilting the handle of the gun forward helps with concealment. Many feel this is the most natural feeling way to carry. There are different areas on the waist that you can wear your holster. You will find the most comfortable place for you and the desired amount of cant. Right behind the hip, at the 4 o’clock position, seems to be the best place to start when deciding what position you would like to carry. Outside waistband holsters are the most popular choice for open carry. Pocket holsters are great for hot days while wearing shorts or casual pants, without a belt. It does take some practice to draw from a pocket holster. They are usually equipped with a tab that is supposed to hook onto the pocket as you are drawing the firearm. Pocket holsters hide or diffuse the shape and outline of the pistol, cover the trigger to prevent accidental discharges and provide a smooth draw from a pocket. Ankle holsters can be slow to draw from. You need to practice pulling the pant leg up before drawing. You can reveal your firearm if your pant leg rides up while walking or sitting. However, the ankle holster is a popular way to conceal carry. I found that a lot of people use the ankle holster as a way of conceal carrying a second firearm. If you are new to them, shoulder holsters can be uncomfortable and difficult to put on. Most say, once you have it on correctly, it can be a very comfortable way to conceal carry. Women, who do not want a top that is loose at the waist, will find a shoulder holster an alternative if they put a light jacket or open blouse over it. Some critics say the shoulder holster has safety hazards. We talked about some things to consider while shopping for the holster that may work best for you. Let’s take a look at the different options in holsters for the CM9. There are many options available so I broke this list down to the top 4 picks. This is the lightest holster out there. It weighs a mere 3 oz. It has adjustable retention screws, custom made kydex inside, and slips on and off your belt easily. The belt clip is made with a thick, sturdy plastic. There is a full sweat guard to protect your sidearm and help with reholstering. This inside the waistband holster has an adjustable cant. It’s lightweight and durable with a sweat guard to protect your firearm from moisture. Comfortable enough for everyday use, no matter how you are dressed. Their claim to fame is the Nemesis revolutionized pocket holsters. 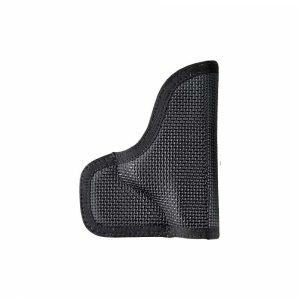 This synthetic pocket holster is designed to carry a wide range of small handguns. It will not move out of place in your pocket. The core has the perfect amount of foam to break up the outline of your gun. 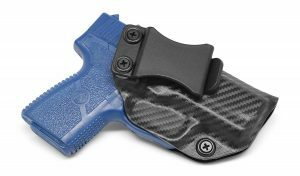 Handcrafted for the CM9, among other pistols, this holster is a hybrid style. Made with leather and hydex, this holster is comfortable, tuckable and easily concealable. There are so many great choices in holsters. Even with all the choices out there, I decided my top pick was the Badger Concealment Kahr Arms IWB Holster. It is so lightweight and comfortable. Putting it on and taking it off seems to be as easy as putting on your shoes. It is an affordable yet quality made product. I think this one may work great for your Kahr CM9. I hope I have given you different things to think about as you shop for a holster. I hope the information I provided was valuable and left you feeling knowledgeable and ready to purchase a great holster to further your self defense skills. Thank you for the information on IWB holsters. 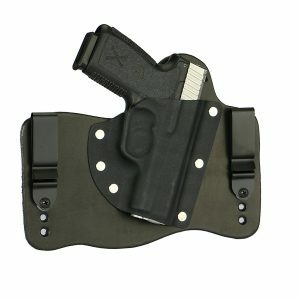 I recently purchased a CM9 for my concealed carry firearm and I have just started to research a holster for it. I have been caring it with a clip draw attached to the pistol. It works well but since its striker fired I felt that the trigger area should be covered. I appreciate the info provided. I will take your advice and will try a badger holster. Thank you again !!! !